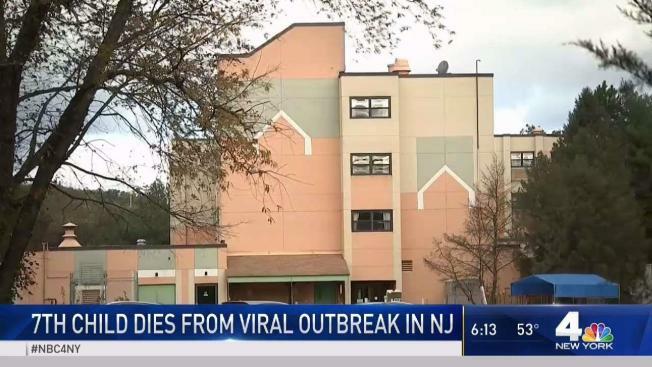 The death toll has climbed in the viral outbreak in a medical center in New Jersey. Seven children have now died at a nursing and rehabilitation center. Rana Novini reports. An 8th child has died at a medical center hit by a viral outbreak, the New Jersey Department of Health says. Seven other children at the Wanaque Center for Nursing and Rehabilitation in Passaic County have died recently after being exposed to an adenovirus outbreak at the center, however, the virus was not yet confirmed in the eighth child on Friday evening. The news comes after four additional cases of adenovirus at the pediatric long-term care medical facility in Passaic County was confirmed, bringing the total number of young patients infected to 23, health officials revealed Friday. The New Jersey Department of Health said additional laboratory tests confirmed the additional cases. The medical institution houses the Pediatric Center; the eight deaths have taken place up to date, with the latest being announced Wednesday. The medical center has been grappling with a “severe outbreak” of adenovirus, a family of viruses that can otherwise cause mild illness, according to the state's Department of Health. The facility has been instructed not to admit any new patients until the outbreak ends and they are in full compliance. On Thursday, the Wanaque Center established a 24/7 hotline for families impacted by the outbreak, which has already claimed the lives of seven children. “This is an active investigation of an outbreak of adenovirus so it is possible that lab tests will confirm additional cases. A Department of Health Communicable Disease Service staff member is on site at the facility and monitoring the outbreak. The Centers for Disease Control and Prevention (CDC) is assisting with lab testing and expertise,” the state’s Department of Health says. Adenoviruses are common viruses that can cause a range of illnesses, according to the Centers for Disease Control and Prevention. The viruses cause cold-like symptoms, sore throat, bronchitis, pneumonia, diarrhea, and pink eye. Adenoviruses can pose serious complications to certain people, particularly those with weakened immune systems, respiratory issues and cardiac disease. That is the case at the Wanaque Center, health officials said. "Unfortunately, the particular strain of adenovirus (#7) in this outbreak is affecting medically fragile children with severely compromised immune systems," the New Jersey Department of Health in a statement Tuesday. "This strain has been particularly associated with disease in communal living facilities." The state’s Department of Health said they were informed of the outbreak on Oct. 9. On Sunday, state health officials found handwashing discrepancies. The I-Team has uncovered inspection reports for the center dating back to 2015. During that time the facility was cited for 14 violations, including infection control. The Wanaque Center is a for-profit facility that, according to its website, works with "with medically fragile children" from newborn to 22 years of age. The center also serves as an adult nursing home and rehabilitation center for short- and long-term care.